I recently had the opportunity to visit a large metropolitan hospital that uses about 200 units of RBCs in the OR and ER every day. They were interested in learning about how temperature indicators might help them preserve their blood supplies, which is why I was there. When I asked the blood bank supervisor how many units they lose each day she responded “zero.” A little further into the conversation, I asked her again and she said, “maybe a few per month.” Next, I asked her how many of those were lost because of temperature exposure. She didn’t know. While a number as “low” as five units a month may not seem significant, particularly for a large institution, the costs can mount up quickly. If one unit of RBCs is estimated at $250, for example, then losing “only a few” units each month can mean $15,000 to $20,000 a year. And for smaller hospitals, losing even one or two units a month adds up to $2500 or $5000 annually. And, as Dr. Robert A. DeSimone said in an interview with Medical Lab Management in 2017, “Blood products are a precious resource…we have tremendous respect for our blood donors and their provision of this valuable resource to our hospitals and patients.” His point? Monetary cost aside, every unit of blood lost is the loss of a truly precious resource. How can you determine what you are losing if you don’t keep track? Reviewing the grid regularly gives you the opportunity to tally your monthly losses, as well as look for any trends. This can help you uncover the REASONS for the losses, which may give you insight into what measures can be taken to reduce or prevent those losses from happening. Download PDF of the Blood Disposal Log. What improvements can be made when you do log blood losses? 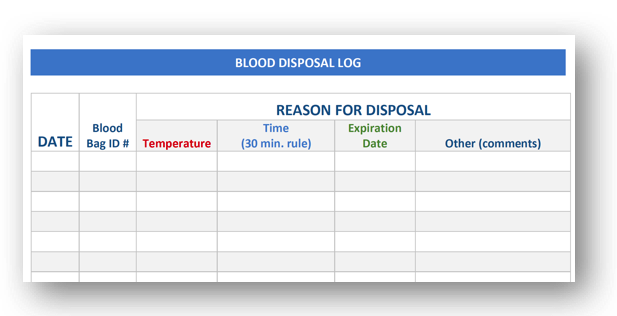 One outcome of this logging exercise is evaluating whether or not you should actually be disposing of blood. Is it safe to return to inventory, or not? Scenario #1: Blood is not returned to the blood bank based on the 30-minute rule. Result: There is no proof that the unit actually exceeded the recommended transport/temporary storage temperature. You could be disposing of a perfectly good unit of blood. Scenario #2: Blood is measured with an infrared thermometer upon return to the blood bank and deemed viable. Result: There is no proof that the unit didn’t exceed temperature guidelines during the period it was out of the blood bank (you can read more about infrared thermometers here). It may not be safe to return to inventory. Scenario #3: Using an irreversible temperature indicator provides proof as to whether the blood should or should not be returned to inventory based on temperature exposure. Result: You only return blood that has not been exposed to excessive heat to the blood bank, assuring patient safety and minimizing risk. Plus, you may be able to avoid disposing of some units of blood you may have otherwise – saving a valuable resource and money over the long term. Are temperature indicators worth the expense? Simply put, using an irreversible temperature indicator is the only way to have confidence that blood is safe to return to inventory – potentially preventing unnecessary disposal. While there is an associated cost to using indicators, if you are able to save even one unit of blood each month, valued at $250, the cost of temperature indicators is quickly offset by the savings. Costs are also justified by the added peace of mind and your ability to preserve valuable blood supplies.